This innovative genre-based writing guide for composition courses teaches students how to use both words and images, in writing and in speaking. To be truly successful communicators in today’s world, students need to be fluent in multiple modes of communication: written, visual, and oral. Providing instruction in, and samples from, diverse genres of writing, Compose, Design, Advocate also has an advocacy focus that encourages students to use written, visual, and oral communication to effect change in their lives and communities. With compelling reading selections, in-depth “Thinking through Production” writing assignments, and excellent coverage of research, Compose, Design, Advocate is a highly teachable text that challenges and engages students. This writing guide introduces students to analyzing and composing in diverse genres, such as posters, editorial and opinion pieces, essays, and research projects. In Chapters 10-14 students learn about different genres by first doing a rhetorical analysis, then reading examples of each genre, and finally developing compositions of their own in each genre. 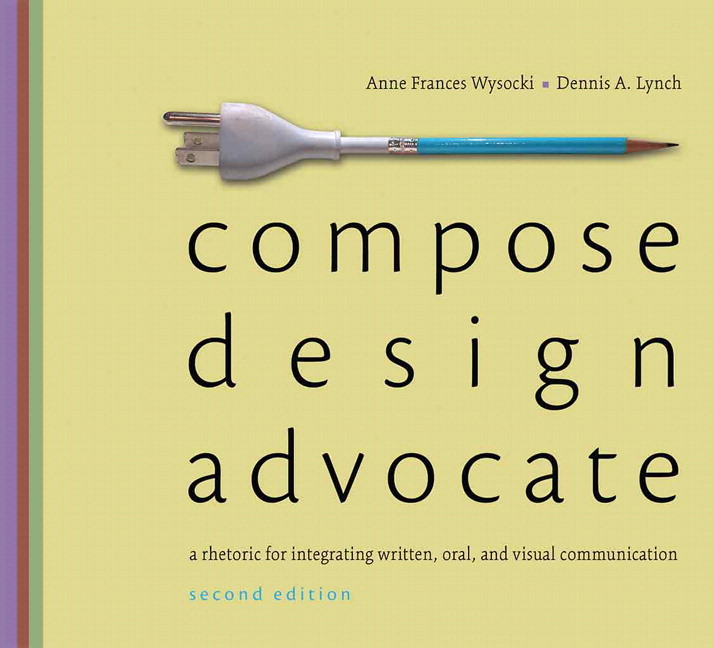 Chapters 1-3 introduce students to the basics of the composing process, with an emphasis on the rhetorical concepts of audience, purpose, context, and design. Chapter 4 on “researching” walks students through the research process, from developing an initial research question to producing a research project. Chapter 8 on “advocacy” teaches students how they can use written, visual, and oral communication to advocate for change, to do work in the “public” world. It also includes several readings that show others practicing such “civic” communication. Chapters 5-7 teach students key vocabulary and concepts for working in each of the three “modes” of communication — written, visual, and oral. Here each “mode” is treated in depth, in its own chapter, with numerous examples and practice assignments. Reading selections in Compose, Design, Advocate are diverse and engaging — they range from Gary Smith’s “Higher Education,” to U.S. wartime recruiting posters, to opinion pieces concerned with video game violence, to Lynda Barry's "Common Sense." “Thinking through production” assignments throughout the book encourage students to practice composing in different genres and using the tools of written, visual, and oral communication. The book is written AND designed by Anne Wysocki and Dennis Lynch. In Compose, Design, Advocate, the authors have worked hard to practice good principles of written and visual communication, and to also create a book with a distinctive look and voice. Enhanced rhetorical focus. A new Chapter 9, "Doing rhetorical analysis of others’ texts" provides comprehensive coverage of rhetorical analyis. More student sample texts. The number of sample student texts has doubled and now includes models of a fully documented research paper. Research develops into a paper, an oral report, and a photo esaay. Chapters 4 through 8 one student carries out the research process (including developing an annotated bibliography) and then uses that research to develop a draft and a final revision of a written research paper, an oral report with supporting slides, and an argumentative photo essay. New readings and visual samples. Chapters 8—14 contain many new readings and visual examples. The genre chapters, Chapters 10-14, have been revised to better guide students in how to move from their analysis of the genre to writing in the genre. Each of these chapters includes a strategy box that alerts students to the key approaches used in the genre being studied. Strengthened coverage of plagiarism and ethics. There is new content showing students how to engage with and cite their sources and how evaluate sources for relevance and credibility. WPA Learning Outcomes. The Introduction includes a correlation between the WPA outcomes and the content in this book so students understand what is expected of them and what they will learn. Streamlined look. The book has a whole new, streamlined look to make it even easier to find and explore. There are countless revisions throughout the book to improve the flow of content as well as its visual design. Who changes and who benefits when you advocate? Being an advocate, being a citizen, and being a critic: "The Partly Cloudy Patriot"
Grounds for advocacy--and for living: "The False Idle of Unfettered Capitalism"
A photographic essays: excerpt from "American Muslim Students"
Opinion: "Separating fact from fiction in video game debate"
Editorial: " Violence: Video Games and What We're Not Playing"
Evaluating logos of an editorial: "Court majority was right"
A rhetorical analysis of "The Periodc Table"
Preparing to read the essay "Higher Education"
Preparing to read the essay "The Smallest Woman in the World"
Preparing to read the essay "What Does It Mean to Be Cool"